Experts say that store shelves separating toys for boys from those for girls limit children's imaginations—and retailer revenues. "Batman v Superman: Dawn of Justice," the latest feature film from Warner Bros.’ DC Entertainment unit, is an unqualified commercial hit. The movie grossed $166.1 million in its opening weekend, shattering box-office records. "Batman v Superman" also made cinematic history as the first-ever live-action film to feature DC’s iconic Wonder Woman, first introduced in late 1941. The appearance sets up DC’s forthcoming solo Wonder Woman movie, slated to reach theaters in 2017. Wonder Woman also features in official "Batman v Superman" toys and merchandise manufactured by DC partner Mattel. Despite the buzz surrounding the character, Wonder Woman action figures were by no means guaranteed: Toy lines based on comic books and other pop culture franchises have regularly given short shrift to female characters. Think back to the 2015 holiday season, when social media slammed toy manufacturer Hasbro for its failure to properly spotlight "Star Wars: The Force Awakens" breakout heroine Rey in its merchandise. For example, a Target-exclusive action figure six-pack excluded Rey in favor of new male characters Finn, Poe Dameron and Kylo Ren, alongside Chewbacca, an unnamed Stormtrooper and an unnamed First Order pilot. Hasbro even issued a statement addressing Rey’s absence from its Star Wars: Monopoly board game, saying the character was left out for fear of divulging "a key plot line." Hasbro and Mattel faced a similar backlash last summer when they offered competing "Avengers: Age of Ultron" playsets that were inspired by a key sequence featuring Scarlett Johansson’s Black Widow character descending from the team's jet on a motorcycle. Instead of including Black Widow action figures, however, Hasbro and Mattel replaced the character with Captain America and Iron Man, respectively, effectively writing Black Widow out of her signature scene. Hasbro earlier released a "Guardians of the Galaxy" action figure set that left out Gamora, the team's sole female member, despite female moviegoers making up 44% of the Marvel Studios production’s $94 million opening weekend audience in summer 2014. Experts say the decisions to minimize female characters across licensed toy lines like "Star Wars" and "Avengers" reflect a larger industry trend of marketing toys expressly for either boys or girls, but not both. In fact, some contend that retailer toy aisles are more gender-defined now than in previous decades, when sexism and discrimination were more prevalent throughout the culture at large. But the tide appears to be turning. In addition to Wonder Woman’s inclusion in the "Batman v Superman" product line, she’s also headlining DC Super Hero Girls, a new toy and apparel line aimed at girls between the ages of 6 and 12. The collection, manufactured by Mattel and launched exclusively at Target stores, also features products based on DC characters like Supergirl (star of her own CBS television primetime series), Batgirl and Harley Quinn, the Batman villainess who makes her leap to the big screen in this summer’s "Suicide Squad." The DC Super Hero Girls collection spotlights iconic characters like Wonder Woman, Supergirl and Batgirl alongside modern-day fan favorites including Harley Quinn. According to a press release trumpeting the rollout, DC Super Hero Girls heralds a series of industry milestones. The line encompasses the first-ever 6-inch action figure line created for girls, the first 12-inch collection of “action dolls featuring strong, athletic bodies that stand on their own in heroic poses,” and the first action role-playing toys for girls. Nessel agrees that an action toy line marketed so explicitly to girls presents its own questions of gender inclusivity, but says that DC Super Hero Girls still represents a step in the right direction. 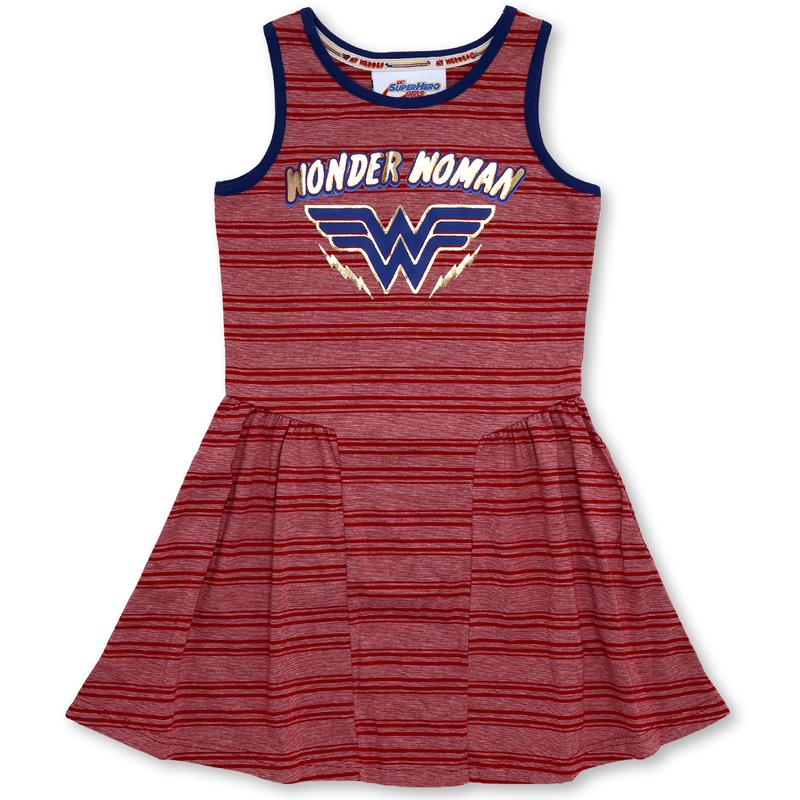 Beyond toys, DC Super Hero Girls features apparel for girls ages 6 to 12, like this Wonder Woman dress. A study on toy advertising published in The Atlantic in late 2014 notes that between the 1920s and 1960s, retailers and their manufacturer partners pitched products to girls by emphasizing concepts like domesticity and nurturing, while ads for toys like erector sets pledged to help boys hone their mental development by learning engineering skills. Even so, roughly half of all toys were advertised in gender-neutral contexts. The presence of gender tropes in toy ads declined sharply in 1970s, due in part to the rise of feminism, increasing numbers of women in the workplace and other cultural forces disrupting traditional stereotypes. But according to The Atlantic, the Federal Communications Commission’s 1984 move to deregulate children’s television programming triggered an explosion in animated fare inspired by toy lines—for example, "G.I. Joe," "Transformers" and "Masters of the Universe"—and gender quickly became a major differentiator of these cartoons and related licensed merchandise. Not even toy industry awards are immune from gender politics. At the annual Toy Fair exhibition, the Toy Industry Association trade organization honors both a “Boy Toy of the Year” and “Girl Toy of the Year.” Lego’s "Star Wars: The Force Awakens" Millennium Falcon claimed the boy toy award for 2016, while Moose Toys’ Shopkins Scoops Ice Cream Truck took the top prize in the girl toy category. Adrienne Appell, the Toy Industry Association’s director of strategic communications, told Retail Dive that the decision to honor a “Boy Toy of the Year” and “Girl Toy of the Year” simply mirrors the standard layout of retailer toy aisles. Nessel maintains that gender-based toy marketing also affects lives by reinforcing age-old stereotypes about identity and limiting personal growth. 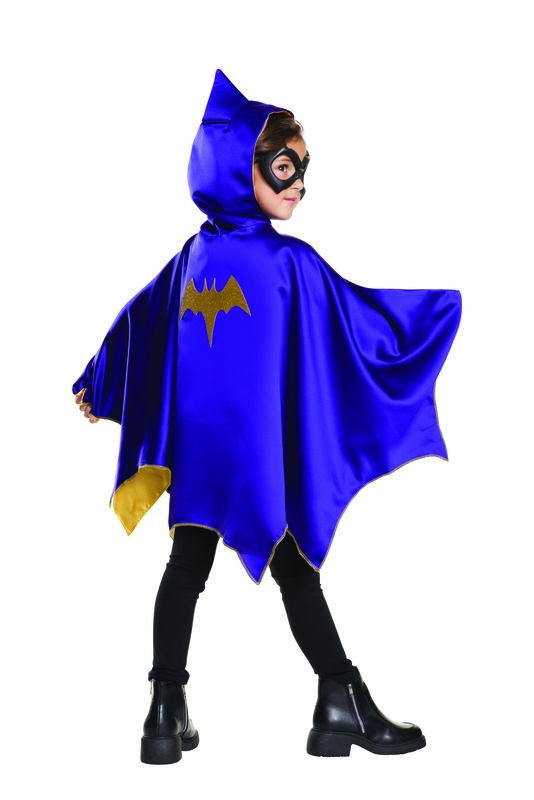 DC Super Hero Girls also encompasses dress-up options like this Batgirl cape. Social media firestorms notwithstanding, the U.S. toy industry enjoyed a banner 2015. Toy sales nationwide grew by 6.7% to $19.4 billion, based on retail sales data from research firm NPD Group. Toys tied to pop culture franchises like movies, television shows and mobile applications led the charge, NPD noted. "Star Wars," the bestselling toy property for the year, alone accounted for more than $700 million in U.S. sales in 2015. Brower has witnessed firsthand the growing appetite for comics and other superhero-themed merchandise. Eight-year-old Challengers, located in a family-friendly area along the western edge of Chicago’s Wicker Park neighborhood, is a magnet for kids raised on a diet of movies, TV shows and games inspired by comics properties. So many children turn up on weekends that Brower and co-owner W. Dal Bush annexed a section of Challengers to create Sidekicks, a store-within-a-store stocked with comics, toys and posters catering to all-ages audiences. Challengers Comics + Conversation, located in Chicago, is a magnet for kids raised on superhero movies and television series. That’s what DC Entertainment, Target and Mattel are banking on. Speaking to the Los Angeles Times following the DC Super Hero Girls announcement, DC Entertainment President Diane Nelson noted that Americans spent $7.4 billion on girls’ toys in 2015 for kids aged 6 to 12, with dolls accounting for a third of those sales. Lee Henderson, Target public relations manager, believes that DC Super Hero Girls merchandise, which went on sale in Target stores in March before expanding to other retailers later this year, could ultimately cross over to boys as well. Challengers includes Sidekicks, a section of the store offering a range of all-ages fare. Target has been increasingly proactive in its efforts to eliminate gender distinctions from the shopping experience. Last year, the retailer announced plans to phase out gender-based signage from a number of departments, including toys. Target toy departments also will cease using pink, blue, yellow or green paper on the back walls of shelves. The company subsequently unveiled Pillowfort, a gender-neutral kids’ bedding collection. Target is not alone. In 2011, British retail chain Hamleys revamped its toy aisles according to category instead of gender, at the same time eliminating “pink floors” for girls and “blue floors” for boys in favor of uniform plain white labeling and red lettering. Two years later, British pharmacy chain Boots also ditched gender-specific toy signage after critics lashed out at the company for promoting scientific toys expressly to boys. Dad Does’ Nessel applauds retailers’ efforts to transform the status quo, but argues that real change begins with manufacturers. Nessel urges manufacturers to rethink how they’re packaging and marketing their toys—for example, showing both boys and girls playing with a toy on the box art or on the manufacturer’s website. In addition, he calls on consumers to push back against the toy industry and demand more gender-neutral products. It’s too soon to determine how DC Super Hero Girls might change the conversation: The line just launched. But if it hits, experts say gender divisions will continue to blur—and that’s super news for retailers, manufacturers and consumers alike. The DC Super Hero Girls line includes 12-inch “action dolls featuring strong, athletic bodies that stand on their own in heroic poses,” according to DC Entertainment, Target and Mattel.